A The research presented has the aim to show that better optimized systems based on Shape Memory Alloys (SMAs) can be designed using muscles working as biomimetic model. In particular the Skeletal muscles and the antagonistic pairs have been used as biomechanical model, they are the voluntary muscles that allow the body to move and they make up 40% of an organism’s body mass (Lindstedt, 2016). Skeletal muscles are held to the bones by tendons, which role is to transfer the force generated by the muscles contraction to the bone joint. Tendons are made of robust tissue and they work as special viscoelastic connectors between bone and muscle. For an adduction movement in a joint, contraction and shortening of the muscle generates a force that is applied on a lever system that causes the joint adduction movements. To recover its initial position, the reciprocal muscle on the other side of the joint contracts and shortens. As described by Biewener and Roberts (2000), muscles are normally coupled in opposition so that movements of joints are driven by a mechanism in which one group of muscles contracts while another group relaxes or lengthens (Aversa et al., 2017 a-e, 2016 a-o; Petrescu et al., 2017, 2016 a-e; Petrescu and Petrescu; Petrescu). Basically antagonistic pairs are muscles where one moves the bone in one direction and the other moves it back the other way in transmission of nerve impulses to the muscles. In the adduction movement of a human arm, the agonist biceps shortens and bends the forearm on the elbow joint, conversely, on arm abduction movement; the antagonist triceps shortens and returns the forearm to its original position. In general, the muscle that applies the force needed for a movement is only one of agonist-antagonistic pairs and, in particular, there is always a selective stimulation driven by the brain that acts on the muscle that contracts or shortens (agonist), while the behaviour of the reciprocal is passive, it works roughly like a brake (antagonist). The active muscle for a specific movement is always the one that contracts (Yang et al., 2013). A unique class of Smart Materials that has in common with muscles the capability to react to an impulse (thermal in this case) with a change of shape and thus also with a contracting movement if necessary is that of Shape Memory Alloys (Van Humbeeck, 2010; Meisel et al., 2014; Melton and Mercier, 1980). This analogy between muscles contraction and extension and the ability of this class of intermetallic alloys to undergo contraction and extension (superelasticity) under the effect of thermal and mechanical stimulation, allow us to derive a biomechanically inspired machine based on these materials. U.S. Naval Ordnance Laboratory discovered shape Memory Effect for the first time during 1960s. The researcher of the Laboratory found this effect in a 1 to 1 alloy of Nickel and Titanium, but only nowadays, a higher spread for biomedical field, actuators, couplings and surgical instruments. Anyhow, applications of SMAs for industrial or product design are still so poorly spread and SMAs potentialities are only rarely and weakly exploited. Nickel-Titanium alloys are intermetallic compounds (Otsuka and Ren, 1999) and they able to show thermal shape memory effect, namely, to return to their original shape on heating even when largely deformed (up to 10%). The Stress-Strain-Temperature diagram of Fig. 1 resumes the thermo-mechanical behaviour of these NiTi based materials. The NiTi alloy assumes, at higher temperatures, an interpenetrating simple body centred cubic structure known as Austenite (Meisel et al., 2014). When brought at lower temperatures (treatment A in Fig. 1 and 2), this intermetallic alloy freely solid-solid transforms to a constrained and more complex face-centred tetragonal crystalline structure identified as Martensite. The Body-Centred Cubic (BCC) crystal structure of Austenite (Xiangyang et al., 2003) shows only one possible crystallographic habit that can be got at equilibrium (high temperatures state 1 in Fig. 1) that is identified as B2 type (Fig. 2). On cooling, Austenite crystals undergo a constrained solid-solid diffusionless transformation to metastable Martensite. After Otsuka and Ren (1999) it has been recognized that, in binary TiNi transformation proceeds from the parent BCC structure (B2 type in Fig. 2) to martensitic FCC lattices. The body-centred cubic parent austenitic phase (B2) may transform by a diffusionless local shear mechanism into an orthorhombic or monoclinic martensite phases. The later martensite lattice is a monoclinic B19′ phase (Otsuka et al., 1971; Knowles and Smith, 1981; Miyazaki et al., 1984; Matsumoto et al., 1987), which has been justified as a monoclinic alteration of the B19 orthorhombic structure (Fig. 2). The transition amongst these structures needs small thermal activation because involves diffusionless transformation and easily results in the restrained and rapid rearrangement of atomic positions. For this crystalline conformation, however, two differently oriented crystallographic variants with small energetic differences exist. These two configurations consist of the twinned (B19 in Fig. 2) and detwinned (B19’ in Fig. 2) rearrangements of atomic planes without crystal plane slip (states 2 and 6 of Fig. 1). Due to thermodynamic considerations, the twinned structure freely occurs in unstressed conditions (state 2). The Martensite is described to be crystallographically reversible, which involves that a given plate undergo a backward reverse shear upon heating. Normally, the Martensite forms, on cooling, only under Ms, however, it could even occur at temperatures higher than Ms if a stress is applied (Yang and Wayman, 1999). The Martensite formed in these conditions is named Stress-Induced Martensite (SIM). It can be deduced that the prevailing driving force for Martensitic transformation above Ms is not thermal but mechanical (transformations B in Fig. 1 and 2). Above the temperature where Martensitic transformation starts (Ms), the stress required to produce SIM progressively increases with increasing temperature (Šittner et al., 2014). where, P is the pressure, T is the temperature and ΔH is the latent heat of phase change (that can be determined by DSC analysis) and ΔV is the volume change of the phase change (the volume change for NiTi Austenitic to Martensitic phases may be calculated from the dimension of the crystalline units, namely a cube of 0.3015 nm for Austenite to the 0.4622×0.4120×0.3015 nm for the Martenisite (orthotrombic or nonoclinic). where, ΔH and T have the same interpretation as for Equation 2 and σ, Ms and ε0 are the applied stress, the shifted Ms temperature and the transformational strain resolved along the direction of the applied stress. Moreover, it has been theoretically predicted (Clasius Claypeiron Equation 2) and experimentally determined (Šittner et al., 2014) that the level of mechanical loading necessary to create Stress Induced Martensite (SIM) growths linearly with temperature. These reversible solid-state phase transformations are known as a martensitic transformation that requires to occur, depending on temperature, mechanical loading stresses between 70 to 140 MPa (Duerig et al., 1990). According to Equation 2 the stress drops to zero at the temperature Ms. The difficulty to stress induce Martensite continues to increase with temperature until Md, above which the critical stress required to induce Martensite is greater than the stress required to move the dislocations (not reversible plastic deformation). Therefore the temperature range for SIM is from Ms to Md. For a number of SMA systems, the agreement in the temperature dependence of the stress to form SIM according to the Clausius-Clayperon equation is quite striking. The equation works equally well for the non-isothermal case, i.e., the case where temperature was held constant while the stress needed to form Martensite was measured. Super-elasticity occurs when a material is deformed above As, but still below Md. In this range, Martensite could be stabilized with the application of stress, but becomes unstable upon removal of stress. By mechanical stretching (treatment B in Fig. 1 and 2), in fact, the SMA is deformed to a larger extent (states 3 to 4 in Fig. 1 and structures B19 and B19’ in Fig. 2). 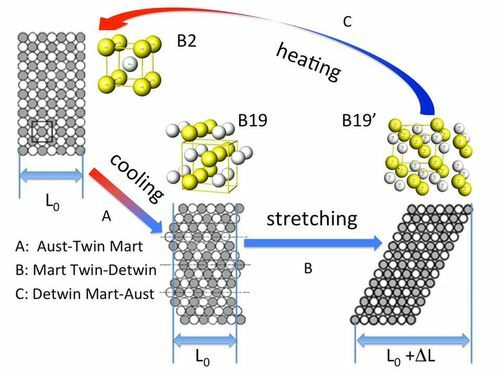 This pseudo-plastic deformation is enabled by reorientation of crystallographic variants in the cold temperature phase following twinned (B19) to de-twinned (B19’) martensite transformations. Consequently, the deformation persists after load removal (from state 2 to 3 in Fig. 1). On re-heating, process C in Fig. 1 and 2, the material progressively transforms to Austenite B2 crystal lattice (from state 6 to intermediate state 7 and final state 1 in Fig. 1) recovering its initial shape. During this shape recovery, large strain changes and large forces are generated that are of particular benefit for the development of temperature-activated actuators. As reported on the temperature axis of Fig. 1, the four characteristic temperatures of SMAs are Mf (Martensite finish), Ms (Martensite start) on cooling and As (Austenite start) and Af (Austenite finish) on heating. When SMA is heated, it starts to change into Austenite phase at As and it completes the transition at Af temperature; similarly, on cooling, it starts the transformation to Martensite at Ms temperature and it completes the transition at Mf temperature. However, for some NiTi alloy compositions, an intermediate phase, called R-phase with rhombohedral structure, could also manifest, in this case the characteristics temperatures are indicated as Rs and Rf. This event manifests itself by thermal events that can be measured in Differential scanning Calorimetry. The calorimetric analysis has been run on our samples to identify not only austenitic than martensitic characteristic temperatures but also the occurrence of the intermediate rhombohedral lattices. The SMAs can exhibit two kind of Shape Memory Effect (SME), defined as one-way and two-way effects. For one-way effect we mean the SMAs ability to remember and resume the macroscopic shape associated with austenitic phase when heated up to Af temperature; for two-way effect, instead, we mean the first ability described added to the capability to recover also the macroscopic shape associated with martensitic phase when cooled up to Mf temperature. To get one or two-way memory effect, in order to program pre-set shapes for martensitic and austenitic phases, thermo-mechanical treatments are required (Naresh et al., 2016). The basic idea of this paper on how and why to use the biomechanical model of muscles working is discussed in the next paragraphs. In order to experiment and develop the biomimetic model aimed to the optimization of systems based on SMAs wires Dinalloy Inc.
Flexinol is a SMA with Nickel and Titanium as main chemical constituents. Thermocalorimetric analyses have been carried out on NiTi alloys. The DSC technique determines the temperature and the heat flows associated with material transitions as a function of time and temperature. It also provides quantitative data on endothermic (heat absorption) and exothermic (heat evolution) processes of materials during physical transitions (Ziólkowski, 2012; Shaw et al., 2008). The thermocalorimetric characterization has been carried out in a nitrogen atmosphere by a Mettler ADSC Differential Scanning Calorimeter equipped with a liquid nitrogen cooling unit in the range of temperatures between -30 and 120°C. Temperature scans were carried out at 5°C/min. For sample stabilization, isothermal scan were run at 500°C, heat flux were recorded up the final apparent equilibrium (heat flux = 0). The high temperature treatment induces the crystal structure atoms to re-arrange into the most compact and regular pattern possible finally resulting in a rigid cubic austenite phase (Kauffman and Mayo, 1993). A typical DSC thermogram performed on a specimen of Flexinol wire (0.25 mm of diameter, 4,00 mg) has been reported in Fig. 3. T For the SMA alloy of our work, a dynamic test composed by one heating segment from -30 to 120°C and one cooling segment from 120 to -30°C and with a rate for temperature change of 10°C per min have been carried out and it is reported in Fig. 3. The thermal analysis have been performed after an isothermal treatment at 500°C, used to simulate the condition needed (annealing) for SMA training, in order to “memorize” its austenitic shape. 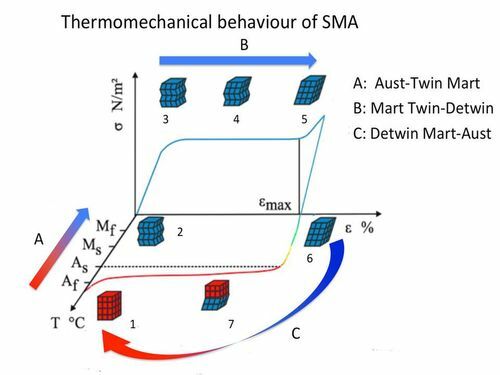 This step is important because the suppliers of SMAs provide only information on characteristic temperatures that the alloy has before of its training, but the range of transition temperatures changes after the heat treatment used for SMA programming (Kus and Breczko, 2010). The apparatus utilized for thermal analysis was a ADSC Mettler Toledo. The DSC traces in Fig. 3 reports the thermograms on heating (lower part) and cooling (upper part) relative to the SMA investigated. All SMA samples were, as previously stated, heat-treated for 10 min at 500°C in order to stabilize the Austenitic phase. The first heating cycle run at 10°C/min, shows the endothermic peak of the Martensitic-Austenitic transition (lower part of Fig. 3). The orthorhombic martensite (B19) phase transformation into the body-centred cubic parent austenitic phase (B2) starts at 49°C and ends at 60°C (dotted lines in Fig. 3). The cooling part of the thermic cycle shows a more complex thermal behaviour. Two peaks were observed on cooling. The B19′ monoclinic Martensite, in fact, can be obtained either by a single step phase change of B2 → B19′ (a single peak in the DSC), or by a two-step phase change of B2 → R-phase → B19′ (Otsuka and Ren, 1999; Otsuka et al., 1976; Yang and Wayman, 1992a; 1992b) and two peaks will be evident on a DSC thermogram. In the two-step transformation, the R-phase is an intermediate rhombohedral phase that is not compatible with the final cubic B2 austenitic phase. The lattice parameters of B2 phase, R-phase and B19′ phase and the correspondences between the B2 to R-phase and B2 to B19′ lattices transitions, have been well established (Otsuka et al., 1971; Knowles and Smith, 1981; Matsumoto et al., 1987; Yang and Wayman, 1992a; 1992b). The two step transformations of B2 → R-phase and sub- sequent R-phase → B19′ may occur upon cooling when Rs (the start temperature of B2 → R-phase transition) is above Ms (start temperature of martensite transformation) (Otsuka and Ren, 1999). This phenomenon was also observed in stress-induced transformations (Otsuka et al., 1976). The differential thermal and the stress–strain treatments of Fig. 2 characterize the temperature-induced and stress-induced two-step transitions in an alloy of NiTi, respectively. Figure 4 reports a detail of the DSC thermograms relative to this double stage transition observed on the cooling thermogram. Upon cooling the parent phase B2 transfers first to rhombohedral phase (R-phase) and then, at Rs, from R-phase to martensitic phase at Ms, finally the martensitic transformation from R-phase is completed at Mf. The reverse transformation occurs from martensitic phase directly to the parent phase B2 at As and is completed at Af. (at temperature near -10°C). On the same Fig. 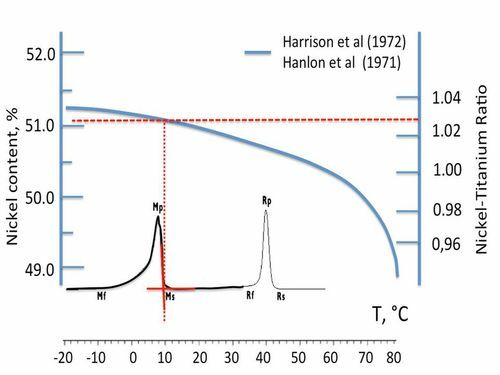 4 (upper part) it has been also reported an experimental curve on the temperature dependence of the Martensite start Ms on Ni-Ti relative composition given either in Nickel content (left axis) and Ni-Ti ratio (right axis) derived from Harrison and Hodgson (1975) and Hanlon et al. (1967) data. From our thermal characterization, a composition of 51% Ni content (1.03 Ni-Ti ratio) has been observed (dotted red line in Fig. 4). Huang et al. (2003) have given a physical explanation that eliminated the need for two different mechanisms to describe the two-way shape-memory effect. They have found that the B19′ structure of NiTi is not stable in his base-centred orthorhombic structure and that it cannot store at the atomic level shape memory effect. Nevertheless, this structure has been described to be stabilized by a wide range of residual internal and applied stresses and that the shape memory is stored primarily at the micro-structural level. 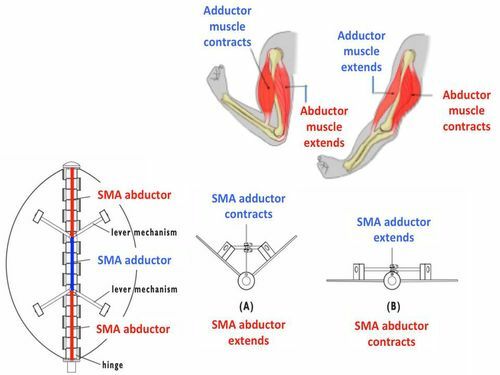 The use of muscle working model depends also on the necessity to optimize the systems based on SMAs by the point of view of their energy need and not only for their ability to change shape. Due to the quite low temperatures for martensitic transition (Mf, -10°C), in order to use a SMA programmed for a two-way shape memory effect in an industrial application, the machine should be equipped of a cooling system to get the Martensitic phase transition and to hold it, on the other hand the need of a heating system to get and hold the Austenitic crystal phase. The kind of system developed is based on the use of SMA wires trained to have a one-way SME and, thus, to “remember” only the pre-set shape associated with austenitic phase. The movements and, thus, the changes of shape depend only on the forces generated by the wire contracting like the antagonistic pairs mechanism existing for the muscles. Basically the system is composed by hinge joints and a lever mechanism assembled to SMA wires. When the wire (SMA adductor blue line in the middle of the machine reported in Fig. 5) shortens, it pulls and causes through hinge joints and lever mechanism the change of shape (adduction of the two parts of the moving systems). To return the system to its original position (abduction), the “reciprocal” external wires on the sides of the joint (red lines in Fig. 5) must contract and shorten. Similarly to work of the muscle, when the wire in the middle contracts, the others stretch and lengthen and vice versa. The wires contraction can be selectively activated by electrical current passage that causes an increase of the wire temperature (due to its electrical resistance and, therefore, their heating (Sofla et al., 2008). A schematic representation of the biomechanically inspired machine is reported in Fig. 6. The solution is possible by the mechanical point of view and affordable referring to the forces generated by the wire. In fact, the characteristic mechanical properties of SMAs, depends on the crystal phase and, thus, for different temperature ranges the mechanical behaviour is different. In particular, the Young’s Modulus of austenitic phase can be several times higher than that of martensitic phase. For this reason SMAs are easier to strain at low temperature (martensitic range of temperature) than at high temperature (austenitic range of temperature). 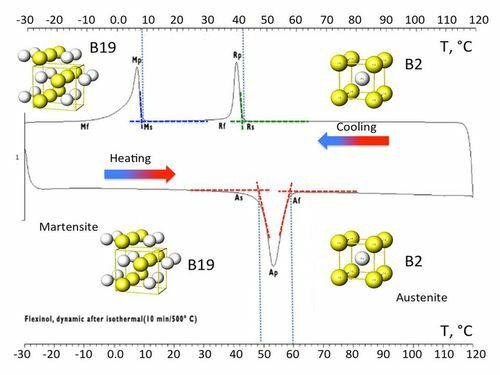 The forces generated, instead, because of the different value of Young’s Modulus during the thermal-induced change of shape associated with austenitic B2 phase are higher than for twinned martensitic B19’ phase (Melton and Mercier, 1980). The force generated in our NiTi alloy wire of 0.51 mm for Martensite B19’ to Austenite B2 transformation is almost 250% higher than for twinned B19 Martensite to the detwinned B19’ Martensite (Dynalloy technical sheet). Namely, the pull force on heating contraction (lower part of Fig. 6) is 34.92 N and once cooled from the underformed B19 to B19’ detwinned strained Martensite force is 13.96 N (upper part of Fig. 6). This thermo-mechanical SMA effect may be used to mimics biomechanical behaviour of agonist and antagonist muscled to precisely drive a bio-inspired machine. As indicated in Fig. 6, where the thermo-mechanical NiTi alloys behaviour and the bio-inspired machine of Fig. 5 are reported, the heated SMA agonist thermal contraction, which is associated to the detwinned Martensite B19’ to Austenitic B2 transformation, produces the adduction of the two machine arms, meanwhile the SMA abductor extends passing from B19 twinned Martensite to stretched detwinned B19’ Martensite (A in Fig. 5). The machine arms extension can be, conversely, obtained by inverting the heating-stretching signal (B in Fig. 5). In this movement the previously extended SMA abductor contract from B19’ detwinned Martensite to B2 Austenite while the SMA adductor extends from twinned B19 to detwinned B19’ Martensite. A system that exploits the above-mentioned mechanism can be used, in general, for industrial applications characterized by a smart and responsive behaviour. The aim of the research presented is not to design a specific application, but to provide a biomimetic model to be used for a wide range of adaptive applications (switchable windows, smart shadow systems, parking and urban shelters, etc. ), where the shape changes in response to different external stimuli. Some advantages connected to the use of the biomimetic model of muscle working are discussed in more detail in the next paragraph. To better understand the advantages listed, it is important to underline that a SMA trained for one-way effect, when heated up to Af takes the macroscopic shape associated with austenite and then, cooling down, altough there is a change of crystal phase it retains the macroscopic shape of austenitic phase(if no loads are applied). Differently, if the SMA has been trained for a two-way effect, when it cools down, changes its shape taking the shape associated with martensite. 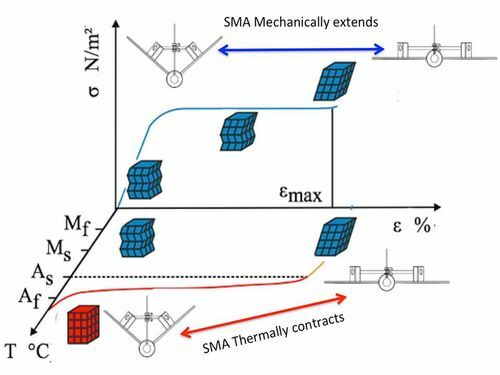 A problem of two-way effect is that it is easy and fast to heat the SMA by electrical current, but the cooling time (if no external and appropriate devices are used) is quite high and depends on room temperature and on geometry of SMA. Our SMA wire with a diameter of 0.51 mm and a current of 4 A takes 1 sec to contract (austenite) but roughly 17 sec to cool down to 70°C (considering a room temperature in static air) (Dynalloy technical sheet). Heating and cooling times are strongly dependent on many factors (current, chemical composition, geometry and thickness of SMA, room temperature, presence of cooling systems, etc.). Anyhow it is enough to show the large difference between the times needed to heat and cool a SMA wire. In the first case we have energy consumption (E) of 0.0001 kWh/month and in the second of 0.7200 kWh/month (Technical sheet Dynalloy). Moreover, using one-way effect and, thus, avoiding heating for a long time a SMA wire, there is no overheating. If a SMA is overheated, there is a degradation of its properties (Velázquez and Pissaloux, 2012). Finally, also the training of SMA with one-way effect become easier and cheaper, in fact, the treatment requested to set the austenitic shape is composed only by one step, instead, two-way training (SME or SIM training procedures) needs thermo-mechanical treatments that must be repeated 20-30 times (Lahoz and Puértolas, 2004). This text was acknowledged and appreciated by Assoc. Pro. Taher M. Abu-Lebdeh, North Carolina A and T State Univesity, United States, Samuel P. Kozaitis, Professor and Department Head at Electrical and Computer Engineering, Florida Institute of Technology, United States, Muftah H. El-Naas PhD MCIC FICCE QAFCO Chair Professor in Chemical Process Engineering Gas Processing Center College of Engineering Qatar University and Shweta Agarwala Senior Research Scientist at Singapore Center for 3D Printing Nanyang Technological University Singapore, whom we thank and in this way. This research has been funded by Italian Ministry of University and Research project FIRB Future in Research 2008, project RBFR08T83J. All the authors contributed equally to prepare, develop and carry out this manuscript. This article is original. Authors declare that are not ethical issues that may arise after the publication of this manuscript. Aversa, Raffaella; Petrescu, Relly Victoria V.; Apicella, Antonio; Petrescu, Florian Ion T.; 2017a Nano-Diamond Hybrid Materials for Structural Biomedical Application, American Journal of Biochemistry and Biotechnology, 13(1). Aversa, Raffaella; Petrescu, Relly Victoria; Akash, Bilal; Bucinell, Ronald B.; Corchado, Juan M.; Berto, Filippo; Mirsayar, MirMilad; Chen, Guanying; Li, Shuhui; Apicella, Antonio; Petrescu, Florian Ion Tiberiu; 2017b Kinematics and Forces to a New Model Forging Manipulator, American Journal of Applied Sciences 14(1):60-80. Aversa, Raffaella; Petrescu, Relly Victoria; Apicella, Antonio; Petrescu, Florian Ion Tiberiu; Calautit, John Kaiser; Mirsayar, MirMilad; Bucinell, Ronald; Berto, Filippo; Akash, Bilal; 2017c Something about the V Engines Design, American Journal of Applied Sciences 14(1):34-52. Aversa, Raffaella; Parcesepe, Daniela; Petrescu, Relly Victoria V.; Berto, Filippo; Chen, Guanying; Petrescu, Florian Ion T.; Tamburrino, Francesco; Apicella, Antonio; 2017d Processability of Bulk Metallic Glasses, American Journal of Applied Sciences 14(2):294-301. Aversa, Raffaella; Petrescu, Relly Victoria V.; Akash, Bilal; Bucinell, Ronald B.; Corchado, Juan M.; Berto, Filippo; Mirsayar, MirMilad; Chen, Guanying; Li, Shuhui; Apicella, Antonio; Petrescu, Florian Ion T.; 2017e Something about the Balancing of Thermal Motors, American Journal of Engineering and Applied Sciences 10(1). Aversa, R.; Parcesepe, D.; Petrescu, R.V. ; Chen, G.; Petrescu, F.I.T. ; Tamburrino, F.; Apicella, A. 2016b Glassy Amorphous Metal Injection Molded Induced Morphological Defects, Am. J. Applied Sci. 13(12):1476-1482. Aversa, R.; Petrescu, R.V. ; Petrescu, F.I.T. ; Apicella, A.; 2016c Smart-Factory: Optimization and Process Control of Composite Centrifuged Pipes, Am. J. Applied Sci. 13(11):1330-1341. Aversa, R.; Tamburrino, F.; Petrescu, R.V. ; Petrescu, F.I.T. ; Artur, M.; Chen, G.; Apicella, A.; 2016d Biomechanically Inspired Shape Memory Effect Machines Driven by Muscle like Acting NiTi Alloys, Am. J. Applied Sci. 13(11):1264-1271. Aversa, R.; Buzea, E.M.; Petrescu, R.V. ; Apicella, A.; Neacsa, M.; Petrescu, F.I.T. ; 2016e Present a Mechatronic System Having Able to Determine the Concentration of Carotenoids, Am. J. of Eng. and Applied Sci. 9(4):1106-1111. Aversa, R.; Petrescu, R.V. ; Sorrentino, R.; Petrescu, F.I.T. ; Apicella, A.; 2016f Hybrid Ceramo-Polymeric Nanocomposite for Biomimetic Scaffolds Design and Preparation, Am. J. of Eng. and Applied Sci. 9(4):1096-1105. Aversa, R.; Perrotta, V.; Petrescu, R.V. ; Misiano, C.; Petrescu, F.I.T. ; Apicella, A.; 2016g From Structural Colors to Super-Hydrophobicity and Achromatic Transparent Protective Coatings: Ion Plating Plasma Assisted TiO2 and SiO2 Nano-Film Deposition, Am. J. of Eng. and Applied Sci. 9(4):1037-1045. Aversa, R.; Petrescu, R.V. ; Petrescu, F.I.T. ; Apicella, A.; 2016h Biomimetic and Evolutionary Design Driven Innovation in Sustainable Products Development, Am. J. of Eng. and Applied Sci. 9(4):1027-1036. Aversa, R., Petrescu, R.V., Apicella, A., and Petrescu, F.I.T., 2016i Mitochondria are Naturally Micro Robots - A review, Am. J. of Eng. and Applied Sci. 9(4):991-1002. Aversa, R.; Petrescu, R.V. ; Apicella, A.; Petrescu, F.I.T. ; 2016j We are Addicted to Vitamins C and E-A Review, Am. J. of Eng. and Applied Sci. 9(4):1003-1018. Aversa, R., Petrescu, R.V., Apicella, A., and Petrescu, F.I.T., 2016k Physiologic Human Fluids and Swelling Behavior of Hydrophilic Biocompatible Hybrid Ceramo-Polymeric Materials, Am. J. of Eng. and Applied Sci. 9(4):962-972. Aversa, R.; Petrescu, R.V. ; Apicella, A.; Petrescu, F.I.T. ; 2016l One Can Slow Down the Aging through Antioxidants, Am. J. of Eng. and Applied Sci. 9(4):1112-1126. Aversa, R.; Petrescu, R.V. ; Apicella, A.; Petrescu, F.I.T. ; 2016m About Homeopathy or ≪Similia Similibus Curentur≫, Am. J. of Eng. and Applied Sci. 9(4):1164-1172. Aversa, R.; Petrescu, R.V. ; Apicella, A.; Petrescu, F.I.T. ; 2016n The Basic Elements of Life's, Am. J. of Eng. and Applied Sci. 9(4):1189-1197. Aversa, R.; Petrescu, F.I.T. ; Petrescu, R.V. ; Apicella, A.; 2016o Flexible Stem Trabecular Prostheses, Am. J. of Eng. and Applied Sci. 9(4):1213-1221. Duerig, T.W., K.N. Melton, D. Stockel and C.M. Wayman, 1990. Engineering Aspects of Shape Memory Alloys. Books on Demand, England, ISBN-10: 0608049980, pp: 511. Hanlon, J.E., S.R. Butler and R.J. Wasilewski, 1967. Effect of martensitic transformation on the electrical and magnetic properties of NiTi. Trans. Metallurgical Society AIME, 239: 1323-1327. Harrison, J.D. and D.E. Hodgson, 1975. Use of TiNi in Mechanical and Electrical Connectors. In: Shape Memory Effects in Alloys, Perkins, J. (Ed. ), Plenum Press, New York, ISBN-10: 0306308916, pp: 583. Kauffman, G. and I. Mayo, 1993. Memory Metal. Chem. Matters, 381: 130-136. Petrescu, F.I.T. and Calautit, K.J., 2016a About Nano Fusion and Dynamic Fusion, Am. J. Applied Sci. 13(3):261-266. Petrescu, F.I.T. and Calautit, K.J., 2016b About the Light Dimensions, Am. J. Applied Sci. 13(3):321-325. Petrescu, F.I.T., Apicella, A., Aversa, R., Petrescu, R.V., Calautit, J.K., Mirsayar, M., et al., 2016a Something about the Mechanical Moment of Inertia, Am. J. Applied Sci. 13(11):1085-1090. Petrescu, R.V. ; Aversa, R.; Apicella, A.; Li, S.; Chen, G.; Mirsayar, M.; Petrescu, F.I.T. ; 2016b Something about Electron Dimension, Am. J. Applied Sci. 13(11):1272-1276. Petrescu, R.V., Aversa, R., Apicella, A., Berto, F., Li, S., and Petrescu, F.I.T., 2016c Ecosphere Protection through Green Energy, Am. J. Applied Sci. 13(10):1027-1032. Petrescu, F.I.T., Apicella, A., Petrescu, R.V., Kozaitis, S.P., Bucinell, R.B., Aversa, R., and Abu-Lebdeh, T.M., 2016d Environmental Protection through Nuclear Energy, Am. J. Applied Sci. 13(9):941-946. Petrescu, R.V., Aversa, R., Apicella, A., Petrescu, F.I.T., 2016e Future Medicine Services Robotics, Am. J. of Eng. and Applied Sci. 9(4):1062-1087. Petrescu, F.I., Petrescu, R.V., 2011a The Battle For Energy, In CONFERENG 2011, November 2011, Târgu-Jiu, in Annals of the “Constantin Brâncuşi” University, Engineering Series, Vol. 5, n. 3, 2011, p. 176-186, ISSN 1842-4856. Petrescu, F.I. and R.V. Petrescu, 2012. Mecatronica-Sisteme Seriale si Paralele. 1st Edn., Create Space Publisher, USA, ISBN-10: 1475066139, pp: 128. Petrescu, F.I and R.V. Petrescu, 2011. Mechanical Systems, Serial and Parallel. 1st Edn., Lulu.com, ISBN-10: 1446600394, pp: 124. Petrescu, F.I., Petrescu, R.V., 2010 The Energies of Today and Tomorrow In CONFERENG 2010, November 2010, Târgu-Jiu, in Annals of the “Constantin Brâncuşi” University, Engineering Series, Vol. 4, n. 3, 2010, p. 112-123, ISSN 1842-4856. 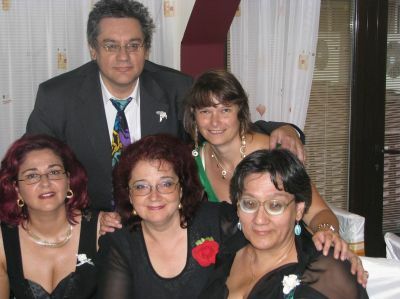 Petrescu, F.I., B. Grecu, A. Comanescu and R.V. Petrescu, 2009. Some mechanical design elements. Proceedings of the 3rd International Conference on Computational Mechanics and Virtual Engineering, (MVE’ 09), Braşov, pp: 520-525. Petrescu, F.I., 2015a Geometrical Synthesis of the Distribution Mechanisms, American Journal of Engineering and Applied Sciences, 8(1):63-81. Petrescu, F.I., 2015b Machine Motion Equations at the Internal Combustion Heat Engines, American Journal of Engineering and Applied Sciences, 8(1):127-137. Petrescu, F.I., 2014 Nuclear Fusion, In journal Infinite Energy, Vol. 20, No. 1 (2014), Issue 113, January 2014, ISSN 1081-6372, p. 44-47, USA. Petrescu, F.I., 2012 Teoria mecanismelor – Curs si aplicatii (editia a doua), Create Space publisher, USA, September 2012, ISBN 978-1-4792-9362-9, 284 pages, Romanian version. Petrescu, F.I., 2011 Some New Elements in Physics, Create Space publisher, USA, November 2011, ISBN 978-1-4679-4880-7, 72 pages, English version. Petrescu, F.I., 2010 Some Applications in Laser Field, In the 3rd International Conference “Advanced Composite Materials Engineering”, COMAT 2010, October 2010, Brasov, Romania, and International Conference “Research & Innovation in Engineering”, Vol. 2, p. 187-192, ISSN 1844-9336. Petrescu, FIT, 2009 About the Ionic Engines. Annals of the “Constantin Brâncuşi” University, Engineering Series, ISSUE 3/2009, Târgu-Jiu, November 2009, “ACADEMICA BRÂCUŞI” PUBLISHER, ISSN 1842-4856, vol. 3, nr. 3, 2009, p. 301-312.